My eagerness to use and enhance my knowledge in power electronics has led me to join Nova last November as a part-timer in Power Train Department. I find power electronics to be a versatile technology to contribute to the fight of the energy crisis and climate change. One of its application is the electric vehicle which Nova is working on with its Electric Racing Motorbike. Although the courses I took at my master program in TU Delft are very extensive and has a lot of hands-on experience, working at Nova still gives me a lot of learning point which makes my ten hours per week worthwhile. In this Nova’s second electric bike team, I was involved in fault analysis of motor controller breakdown, battery cell redesign and currently working on Safety Control Unit (SCU). In November, I was directly put into a team to investigate the failure of the motor controller due to unknown faults in the last experimental test. At first, as someone who never works intensively with an electric vehicle and barely saw Nova electric motor design, it was very hard and abstract to see what went wrong. In the limited amount of time which I have between my master project, I tried to absorbed what was available in a well-documented design folder of Nova. I also proposed to the team to use fault analysis tree and tried to work what went wrong from there. The team was quite open to suggestion and the discussion resulted in better understanding of possible failures that could happen in our system albeit the root cause of the fault was hard to conclude due to an insufficient amount of data from the measurement system. The results of fault analysis are being used as an input for redesign improvement in this year electric motorbike. Due to the fault, the battery was no longer in good condition as well. We use this opportunity also to redesign the cell to have more sufficient capacity and power to win the race. The process of redesign involved many tricky trade-offs from selecting the right cells, putting it into limited space, and many other aspects. My role in this redesign was to assist the full-time engineer by processing the cell information from a different perspective, exploring the possibility and implementation of regenerative braking and participating in the decision-making meeting. The current responsibility given to me is to design the Safety Control Unit (SCU) of our motorbike. The power train of our bike is mainly composed of three building blocks; battery, motor controller, and electric machines. 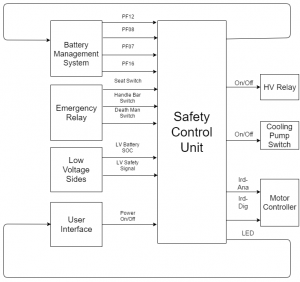 Battery Management System (BMS) is responsible for monitoring the battery cell by cell. The motor controller is a pair of electric machines which maintain its own and the electric machine safety. There are, however, several reasons why SCU is required in our system. First, BMS cannot handle the battery protection on its own because it requires external action to influence critical parameter in its systems such as discharge current and other electrical parameters. Thus, it needs to communicate to the motor controller, relays, and other protection devices through SCU. Second, the interaction between building blocks results in an unsafe region which does not exist if each component works alone. An example of it is a special procedure required to shut down the power train in case of an emergency which needs to be regulated by SCU. The relation between SCU and other components are presented in its I/O block diagram below. In four months, I was working in fault analysis, battery cell redesign and safety system design. Along the way, there was challenges and learning point such as communicating with a different culture and educational background, adapting with the highly iterative design process and time management between my master program. If there were a regret, however, it is that I did not join Nova sooner.